Still on the same site it has occupied since 1876, Speight’s Brewery has become on of Dunedin and Otago’s biggest icons. Not just the “Pride of the South”, the Speight’s brand is one of New Zealand’s most loved beers. 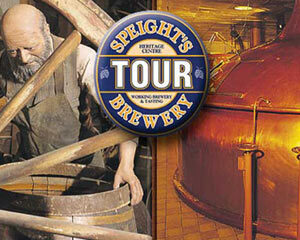 The Speight’s Brewery Tour is an award winning interactive and informative tour guided tour through an historic working brewery. You’ll see, smell, touch and taste the ingredients which go into making Speight’s beers and discover how Speight’s became a legend in the south. Learn about the antiquity of beer in Babylonian times, through to the introduction of beer in New Zealand and then the history of Speight’s Brewery, before entering the brewery itself to learn about our unique brewing process. No tour would be complete without sampling the fine product. Welcome to our brewery bar where you can pour your own and you will enjoy an appreciation session of six Speight’s beers.